A recent article in The Atlantic documents what may be the earliest-known example of computer-generated art. Likely inspired by the image of a calendar pin-up “girl,” a technician working with the military in the 1950s used punch cards to program a vector-traced outline of a semi-naked woman, striking a pose reminiscent of airplane nose art from World War II. 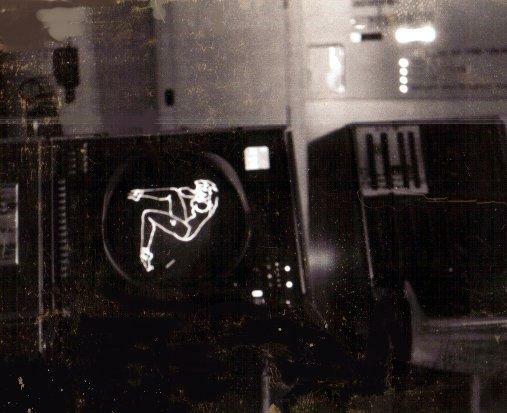 The image, known by some computer operators at the time as “girley1” (“girley2,” a hula dancer, would come along a few years later and serve as an example of early computer animation), often appeared on the radar-like consoles used by the Air Force in the 1950s and 60s as part of the air defense computer system. The computers combined static maps of the U.S. coastline with real-time radar monitoring of the air space and an interactive, graphical interface. With a light gun, operators could point at the blips on their screens and call up flight information—or spot unknown objects.